Whether you are a collector, or you sell classic car parts in your spare time, Classic American Car Parts will teach you the tricks and methods used by professional dealers. From GM to Ford to Chrysler, even AMC, this book will teach you what to buy, how to find it and how to get the best deal. This book will also teach you how to market and sell your parts for maximum profit. These are the secrets the pros use. Published for the first time, much of this information has never been offered to the public. You will learn about part numbers, date codes, quality and what makes certain parts worth more than others. How to find buyable and profitable classic cars and parts. How to “Wheel & Deal” at swap meets, public auctions or in the seller’s driveway. How to maximize profit by “parting out” junk classic cars. How to market and sell your parts at swap meets or on eBay. How to run a successful eBay business. After losing his job of 21 years due to corporate downsizing, the author Dave Lehr knew he was in trouble. He lived in a very rural area. The economy was poor and there were no jobs to be had. He was a middle aged man with no formal education. With a mortgage to pay and mouths to feed, he turned to the only way he knew to make money – “parting out” junk classic cars on eBay. Adversity created motivation, Motivation, work ethic and a love of the hobby created a successful business. Buy direct from our website for $20 and we will cover shipping for US residents. Just click on the PayPal button below. NEVER BEFORE PUBLISHED, SECRETS TO BUYING & SELLING CLASSIC CAR PARTS. Pine Grove, Pa. 10/2/2012 — Full time classic car parts picker and dealer, Dave Lehr reveals in his new book, his secrets to finding, buying and profitably selling antique and classic car parts. With all the interest in “American Pickers”, classic cars, and alternative ways to make extra cash, this book couldn’t be timelier. This is the 1st book EVER cover this topic. If you consider yourself a motorhead, then at some point in your life you have bought used car parts and you most likely sold some parts too. Are you sure you made a good buy or when you sold, did you receive what your parts were worth? There is no way to know for sure without having years of experience…… until now. Dave Lehr is a 30 year professional who explains values, parts identification, and marketing in a way every motorhead can understand and use. One reader recently posted on Amazon “This book is filled with so much information. It kept my interest in every chapter. This book proves you can be a success if you do something you like”. Don’t get “hustled” at the next swap meet or flea market. Dave breaks the silent dealers’ creed by exposing the secrets to negotiating the best deal and re-selling items for the most money. Other dealers are not happy Dave has published this highly profitable information. 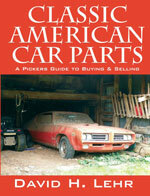 Dave Lehr’s self published new book, Classic American Car Parts, explains parts ID, interchange, and date codes. Also, he offers a parts value gauge that no one ever dared to create. He talks about his strategies to find valuable old parts, make the best buy, and sell them for huge profits in his driveway or at markets like Carlisle Events and eBay. If you consider yourself a “motorhead”, this book is a “must have”. For more information, contact Dave at (570) 527-3450. The author, Dave Lehr and his business Classicjunkyard are an interesting side story. Dave claims he is a product of “corporate downsizing”. Dave wheeled and dealed parts for years as a hobby but was forced into becoming a full time parts dealer in 2005 when Alcoa, his employer of 21 years, axed him in the name of “restructuring”. For additional information please contact Dave at cayne66@comcast.net.